Even before January’s temperatures began to ease out of the deep freeze, the early bloomers in my yard were making tentative moves toward bud opening. 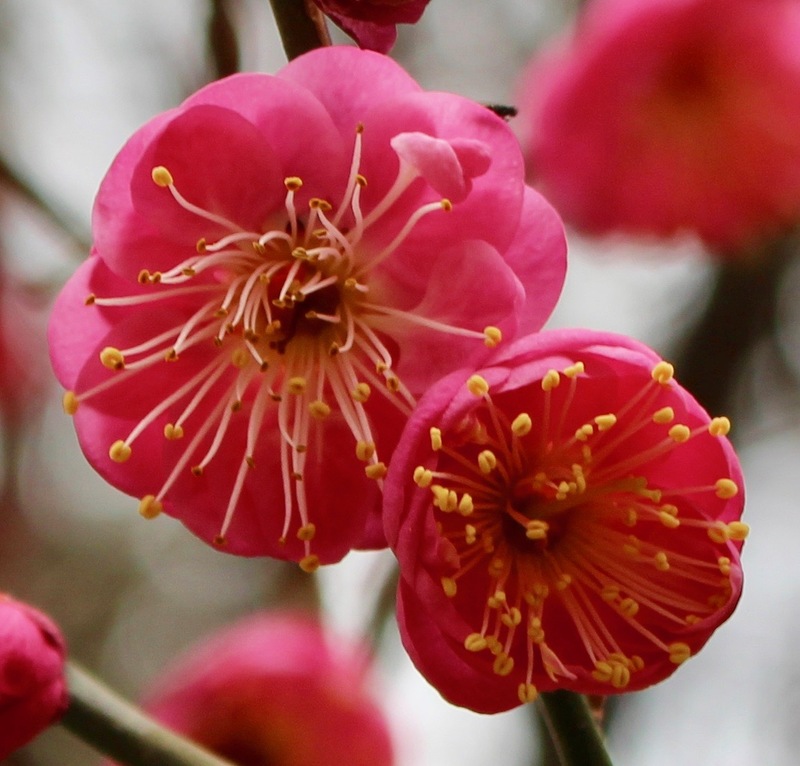 As is always the case, the ornamental flowering apricots (Prunus mume) were the first to plump up their buds with color. By mid-January, all three trees were scenting winter air with the perfume of precocious flowers. My neighbor’s honeybees visit these blooms on any non-windy day that reaches 55-60 degrees. It makes my heart happy to see them eagerly gathering pollen. 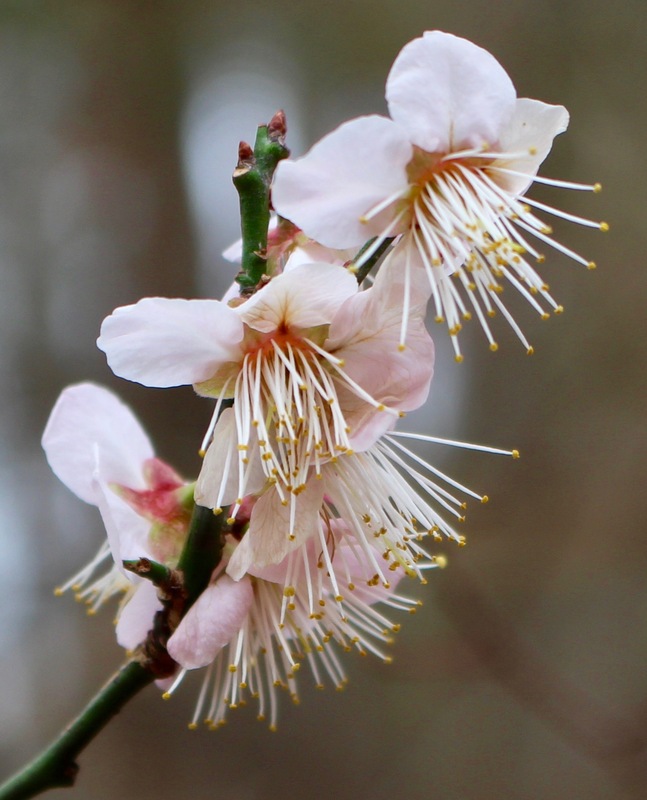 The first apricot cultivar to bloom has lovely pale pink flowers and a sweet, gentle scent. I have forgotten its name, so I call it Pinky. Most of Pinky’s flowers were fully open by mid-January. 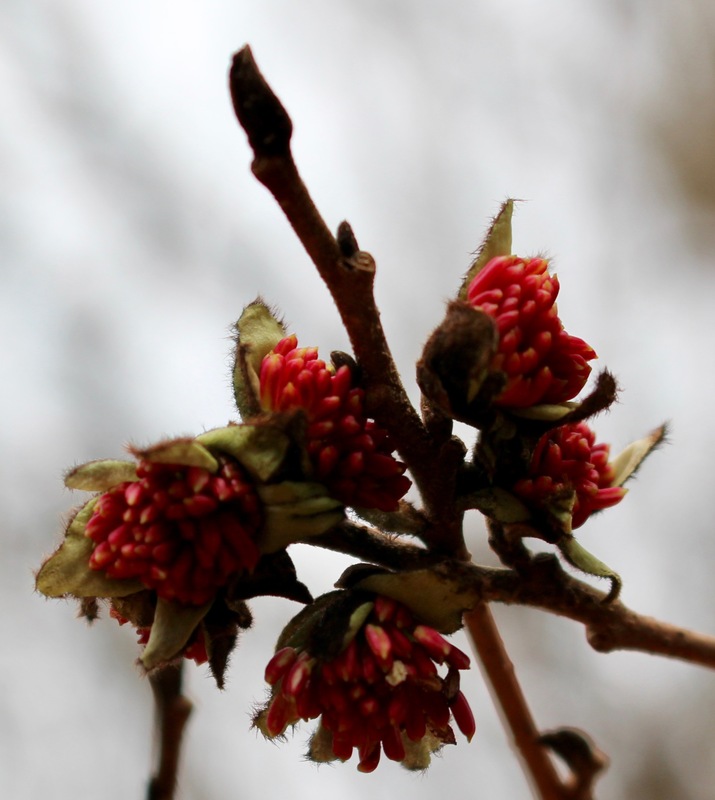 A deep freeze turned those flowers brown, but a few dozen buds had not yet unfurled; they are doing so now. 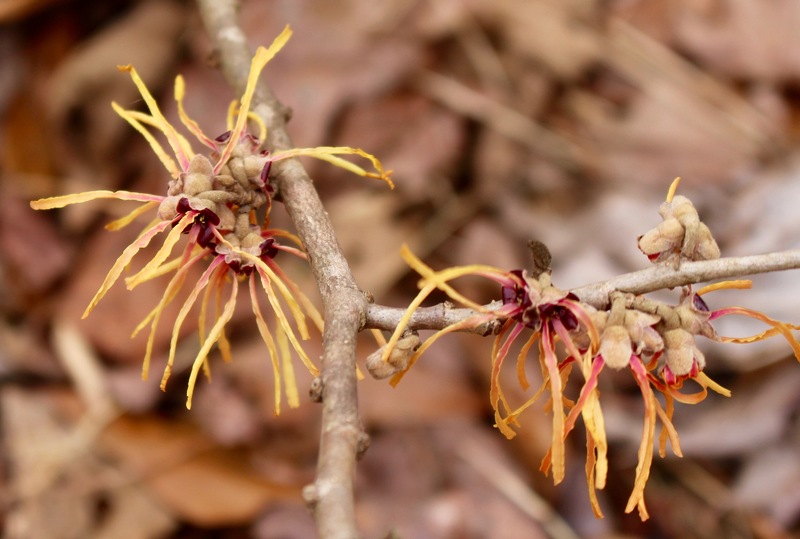 The native witch hazel cultivar I grow has been pushing out occasional flowers since mid-January, but the recent warm spell has encouraged it to go for broke. Lovely magenta strappy petals dangle from bare branches. On warmer days, their clean fragrance is perceptible from several feet away. Eventually, this small tree/large shrub should attain a height of 10-12 feet and become almost as wide. I am so ready for that! I am eager for my witch hazel Amethyst to reach its mature size. Imagine such a shrub covered in blooms like these. 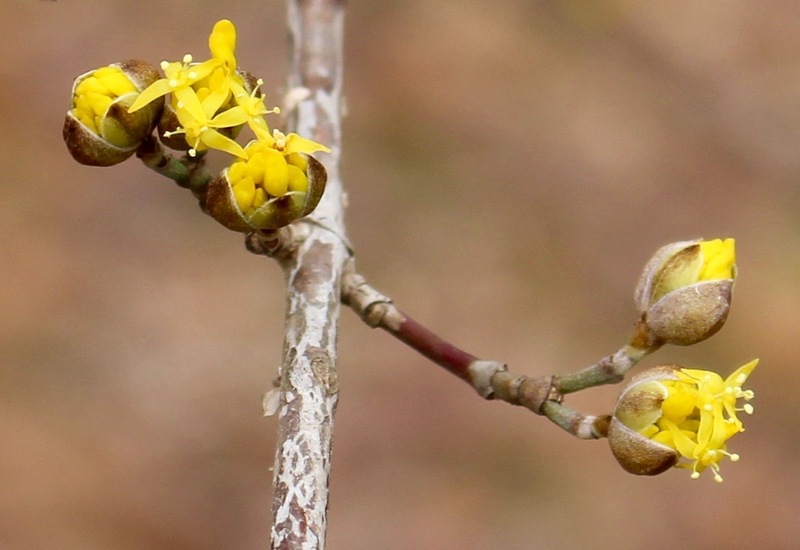 I also grow a hybrid witch hazel that is just beginning to push out its eye-catching flowers. 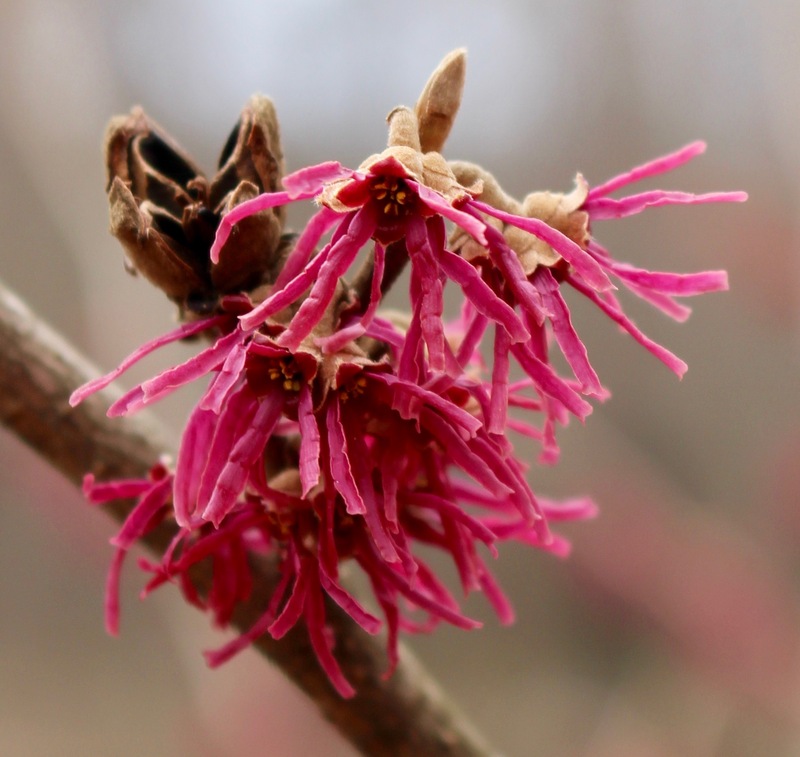 Hamamelis x intermedia ‘Aurora’ flowers glow like a favorite sunset. When it attains its mature size, I expect to be able to see its blooms from across the yard. A few years ago, we added two Cornelian Cherry Dogwoods (Cornus mas). These non-native small trees have just begun their typical early blooming period. Flowers adorn every branch in multiple places, and when they are all open, the small trees are visible from quite a distance. Their common name comes from the red fruits they produce, which are beloved by wildlife, and the main reason I added them. However, mine have not yet produced any fruit. Fingers crossed that this is the year it happens. I grow Persian Ironwood (Parrotia persica) for its spectacular bark and breath-taking fall color. This non-native member of the witch hazel family blooms copiously but inconspicuously this time of year. 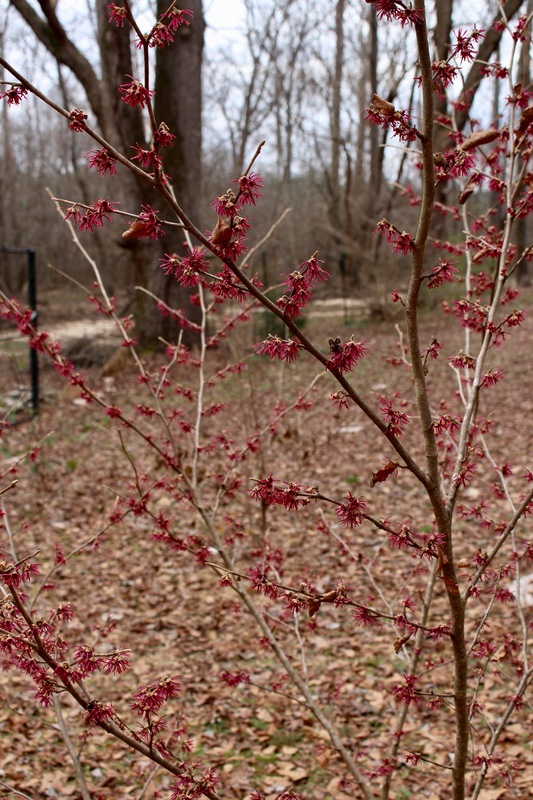 Its small maroon flowers are just beginning to emerge from their buds. Abundant clusters of daffodils are popping up everywhere, their buds visible, but none is showing color yet. 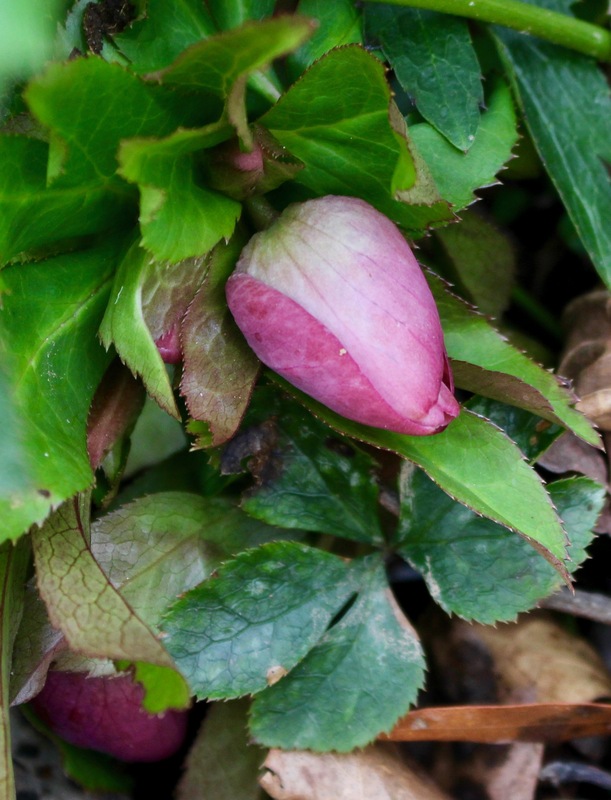 The Lenten roses, however, are full of fat, very pink buds, and deserve a February nod. Finally, I can’t close this piece on early February blooms without acknowledging the abundant tiny flowers that decorate what passes for a lawn in our yard. I saw a few blooming violets earlier, but didn’t see any today. However, the “winter weeds” called Speedwell and Henbit did pose for me. They are pretty and hold the soil; that’s good enough reason for me to let them bloom in peace. Winter will almost certainly make its presence felt a few more times before spring wins out, but these blooms, along with the faint scarlet hue of maple flowers in the canopy and the freshly risen spring greens seedlings in my greenhouse are sure signs of a an imminent new growing season. Oh happy day!